mosey up the dunes to spend the evening. I love love love your blog, but can you please please please ease up on the use of Hipstamatic? In my very humble opinion (which is being offered here as the kindest of constructive criticisms - I hope) it was great in Dublin, but less effective with the Sonic cup. I mean, Birmingham, not Dublin. 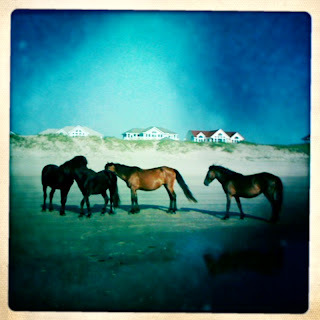 I have to wonder if these are indeed wild horses on a beach, what the heck do they find to eat to look so plump and healthy? I don't have a reliable internet connection at the beach so all I have to work with is iPhone pics... the Hipstamatic is better than the low quality iPhone pics so that is what I'll be using while on vacay. The horses eat up in the sound side.